Four people have been arrested after cutting through the wire at an RAF base in Lincolnshire. 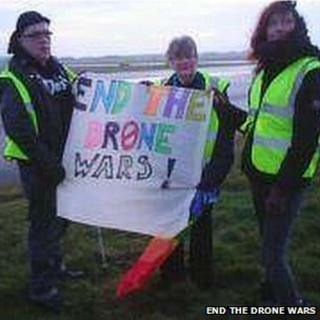 The group were protesting at RAF Waddington about the use of armed drones, controlled from the base, which they claim cause civilian casualties. The four, from Oxford, Nottingham, Leicester and Coventry, are currently in police custody. An RAF spokesman said operation of the drones - known as Reapers - was unaffected. The group, calling itself End The Drone Wars, named the protesters as Chris Cole, 51, from Oxford, Katharina Karcher, 30, from Coventry, Gary Eagling, 52, from Nottingham and Penny Walker, 64, from Leicester. In a statement it said: "We come to RAF Waddington today to say a clear 'no' to the growing normalisation and acceptability of drone warfare. "Thanks to the marketing of drone war as 'risk free', 'precise' and above all 'humanitarian', war has been rehabilitated and accepted as virtually normal by those who see little or nothing of the impact on the ground thousands of miles away." The RAF said: "We fully respect people's right to protest peacefully within the law but have a duty to protect public property and to ensure that we meet operational needs. "MOD has a duty to maintain security at all defence installations and uses all lawful means to do so. "RAF Waddington, like all large airfields, has a large perimeter fence that is protected by a variety of security measures. Whilst some protesters did breach the perimeter fence, Reaper operations continued completely unaffected". Police confirmed the four had been arrested on suspicion of aggravated trespass.